This classic pineapple upside down cake has caramelized pineapple slices on top and a buttery white cake below. All these days, I though making these upside down cakes are difficult but it is not so. This cake is so easy to make and tastes delicious with the caramelized pineapple. You can make this classic cake for parties or small get togethers and completely "wow" your guests. Today we will learn how to make this easy pineapple upside down cake following this simple recipe. If using fresh pineapple, peel and core the pineapple and cut it into quarters with 1/4 inch thickness. If using tinned pineapple, drain the syrup, pat it dry with a paper towel and napkin and keep it ready. Sieve maida, baking powder and salt together twice. Grease and flour the baking pan and keep it ready. In a pan, add butter, brown sugar and stir over medium heat until butter melts and sugar dissolves. After sugar dissolves, continue cooking without stirring for a few more minutes or until bubbles just start to appear around the outside edges of the mixture. Switch off the flame and pour it into the prepared baking pan. Let it cool a little. Then arrange the pineapple slices on top of the sugar mixture. Keep cut cherries in the center and corners or as you like in the space in between. Beat butter and sugar in a bowl until light and fluffy with an electric mixer or with a hand mixer. Add vanilla essence. Add egg yolks one at time and beat well after each addition. Add flour mix (3 additions) and milk (2 additions) alternatively ending with flour. Use electric beater in low speed and stop once mixed well. Do not over beat as the cake will turn hard. In a dry bowl, whisk the egg whites until it forms a firm peak. Using a spatula gently fold in the beaten egg white with the cake batter in two additions. Now tap the baking tray for the batter to spread evenly and smooth the top. Bake in a preheated oven at 180 degree C for 45-55 minutes or until the top of the cake has browned and starts to pull away from the sides of the pan. Insert a toothpick in the center of the cake and if it comes out clean, your cake is done. Remove from the oven and place on a wire rack to cool for about 10 minutes. Once the cake has cooled down, run a knife around the edges of the pan and then invert the cake. Yummy pineapple upside down cake is ready. It can be served warm from the oven or cooled. If needed it can be topped with a dollop of softly whipped cream. Note - If you do not have a 9 inch round pan, use 8 1/2 or 9 inch aluminium cooker separator as I have done. Use the middle rack for baking. Beginners, do check out my tips on baking before starting to bake. This has always been my favourite coffee cake. Yum! Hi, The cake looks beautiful. I loved your pics specially the first one where the pineapple crowns are also visible. need to try once i tried rest of the easy cake ! Wish i get a huge slice of this gorgeous cake,my all time favourite. I do agree with you, this is the best cake to serve your guest. 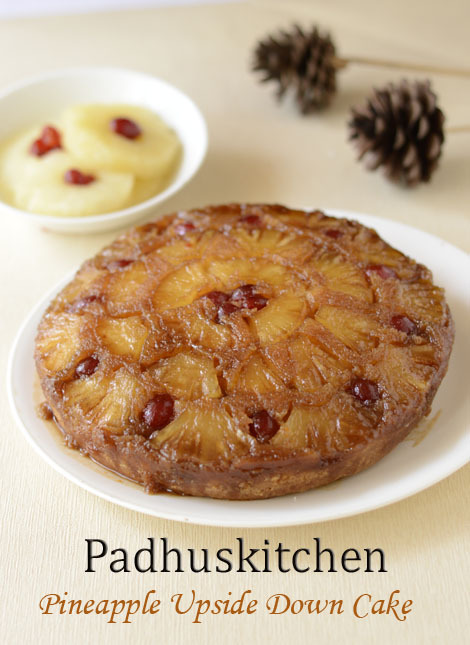 Hi Padhu - I am a novice baker, but tried this recipe today and it came out very well. Thanks for sharing such a easy to follow recipe for a fairly complicated cake. Hi Dear Can u suggest a remedy if i forgot to grease the baking dish? Hi padhu, wonderful drooling recipe. . Any other alternative for brown sugar? You can use white sugar but the color and texture of the cake will change. There might be minor changes in the taste also. Hi Padhu. You haven't mentioned the baking powder in the 'cake preparation' part. Mary Ann - I think you did not notice it properly. I have mentioned it in the third line under preparation. Hi.. Can I use pressure cooker instead of oven to make this cake? You can make any cake in pressure cooker. Just follow my cake in pressure cooker. Picture link on the right side. Use only baking powder as mentioned in the recipe. Hi padhu I am a great fan of your website. I have Onida convection mode micrwave. How to preheat the oven. Can u please tell me ? Kindly read the manual which comes along with it. I have no idea. What is the reason for separating yolks and whites of the egg? Would it affect the cake if I just add the eggs as such.